Oh my. They are definetly here. 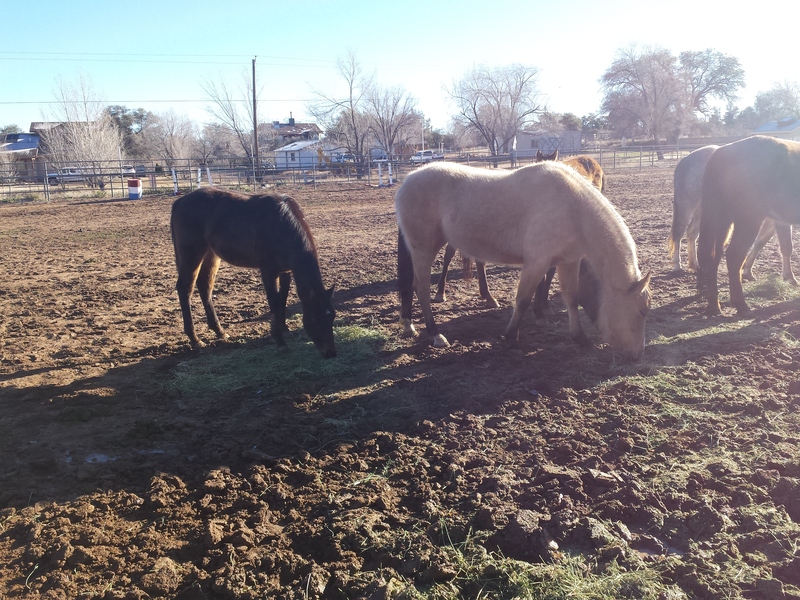 The rescue horses from a slaughterhouse feed lot. Our stable has partnered with a private party who is starting a rescue organization. This endeavor is very exciting and has been in the works for a little while now. So, one night last week our owner here headed out with two trucks, two trailers and a rotation of drivers to switch off. Twenty four hours of driving later, here they are. And ready to run free out of those trailers. They came in at midnight so we were asleep. The next morning, going out to feed, I swear it felt like I was a little kid again and it was Christmas morning. Especially, because I was told there would be BABIES. Is there anything cuter than a baby horse? Really. AND, I’ve been warned not to fall in love. It will be hard. Also there is a pregnant mare “due any day”. That will be fun to blog about. And the pictures of that lil’ newborn foal will be awesome. I CAN’T fall in love though. Right? Anyways, a bit of a recap as to what’s been transpiring around here in these first few weeks of our new year. The woman heading up this rescue mission asked us to partner for a low-cost board and, more importantly, training. You see the problem is that people can rescue horses left and right. But then what? Often they are wild horses and/or completely untrained, often never even touched by a human and are very fearful. Rescue a horse, okay. Then what? Many times rescues end up unwanted horses again. Which puts them in basically the same situation they were in before. Thus, the second very important step to a “rescue” is training. And it has to be good, quality, gentle training because these horses are scared. So, here is where we step in. Not only to provide a place for them to stay but to provide training so they can go to a home. 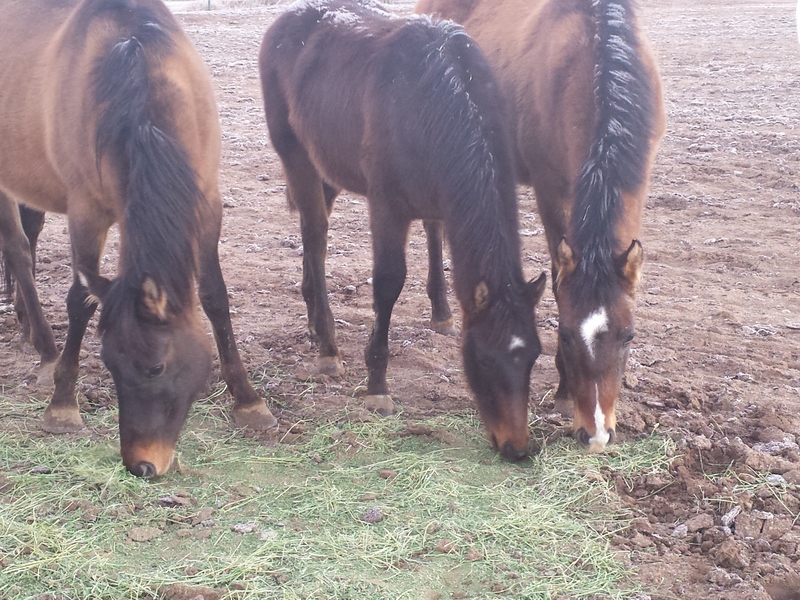 Myself and a team of five others here at the barn have commited one year of training to these little ones. It will be slow and easy, no “cowboying”. One year of imprinting and gentle training with the goal of an excellent and rideable horse to then go to a loving home. I know horses. I know riding. I know training to deal with “behaviors”. But to be perfectly honest, I know nothing more than what I have read or seen in movies about “breaking” a wild horse. I’m ready to learn though. I’m looking forward to sharing these new adventures on the blog as well. Back to the story, I started out with niavely high hopes and then-when it took two hours just to get a halter on the one pregnant mare who has had some human contact-I started to comprehend the reality of this challenge. A week later, I have only been able to touch ONE of these eight. And that was only because it was morning feeding and the girl was starving so I bribed her with food. That counts. Well, we will see how this chapter goes. I feel confident because I will be mentoring under the owner here, who is an amazing trainer and knows how to do this right. I feel grateful to have such an opportunity to learn from him from square one. Wish us luck! What an exciting experience! I can’t wait to read more about your training progress and the new born foal!! 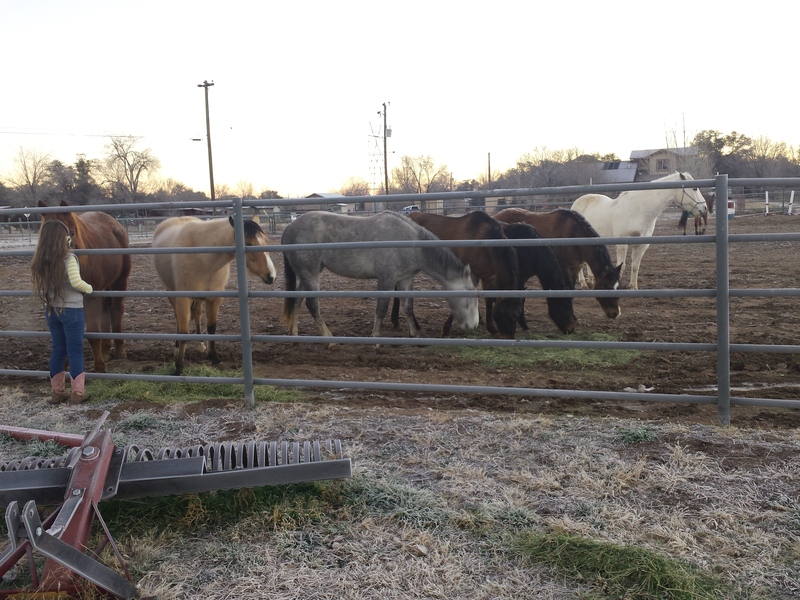 It’s so awesome that you are giving these horses a second chance, best of luck! Bravo! I have only, so far, been able to rescue dogs (all from the street and abusive situations) and I can’t imagine the amount of work that would go into regaining the trust of a horse! Love that you get to experience it! I didn’t know that you rescued dogs. That is so wonderful! Thank you so much for your kind words!! Will be interesting! What an adventurous roller coaster this experience will be. Not falling in love with horses that are in need of just that will be so hard – a little love will be worth it especially when they respond and can then replicate that show of affection with their new owners when the time comes. I am so glad I found your blog today! Yes, you’re right! And they’ve been fun to love 🙂 Looking forward to going over to Pampered Ponies and checking out your blog! Yes, you’re right it does sound a lot like foster care. Interesting that you say that because I have been a foster parent in the past! Hum..I think I will take your suggestion on that book review. it was an amazing book one of my top favorites. I have never really done book review before …this will be neat. This is one of the most wonderful posts I’ve ever read. I’m so happy for the beautiful horses…I can’t even begin to tell you. I love them so much. ❤ This is outstanding…a rescue mission. Thank you.